Home Care Association of Washington - HCAW Online University - OASIS D Webinar Available TODAY! HCAW Online University - OASIS D Webinar Available TODAY! Do you or your staff need a quick overview on the impending OASIS D changes? According to CMS, the OASIS D Guidance Manual will become effective on January 1st, 2019. RCTCLEARN is currently in the process of updating our 10 module comprehensive OASIS Training Series to reflect the approaching OASIS D changes and requirements. The updated OASIS D Training Series will be released in December. In the meantime, we’ve created a 90 minute OASIS D Webinar that will provide an update on the things you NEED to know now about the quickly approaching changes. How do you obtain access to the 90 minute OASIS D Webinar? 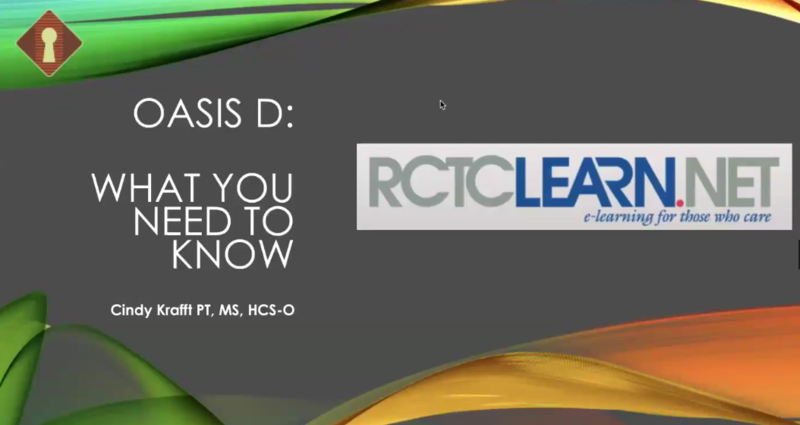 If you are a new or past customer and do not currently have access to RCTCLEARN’s OASIS Training Series, please visit our website at https://rctclearn.net/oasis to preorder your OASIS D Training Series Package. New and returning OASIS Training Series clients will receive access to the Webinar after payment is made and then access to the comprehensive OASIS D Training Series once it is available.